Tensions in US-Turkish relations are growing in proportion to the decline of the lira. The political and economic pressure of Washington caused a 40 percent drop in the Turkish currency against the dollar. Donald Trump personally threatened, and then imposed sanctions on August 1 against the Ministers of Justice and Internal Affairs of Turkey. Ankara was accused of holding hostage to the "innocent" Protestant pastor Andrew Branson, whom Recep Tayyip Erdogan sent behind bars for supporting militants from the Kurdistan Workers' Party and the organizer of the attempted coup d'état of Fethullah Gülen. Ten days later, the United States introduced more serious measures. Trump increased duties for Turkey on aluminum to 20%, and for steel - up to 50%. While for other countries these indicators were set at 10 and 25 percent. Turkey responded with a mirror on sanctions against officials. As for duties, they were increased several times by such goods from the USA as tobacco, alcohol, cars, cosmetics, rice and fruits. Erdogan urged people to abandon American electronics, and some officials began to blow their nose in dollar bills. "Ending the Dominance of the Dollar"
The US pressure is working. And that's why Turkey needs more effective measures than breaking up iPhones or burning dollars. Currently, Ankara is negotiating with Berlin on providing financial assistance to it. Judging by everything, the final decision by Germany will be given during Erdogan's visit, scheduled for September 28. Salvation through loans is a tactical measure. Another, much more serious, but also difficult to implement, method of protection is the rejection of the dollar. Erdogan proposed it at the summit of the Cooperation Council of Turkic-speaking countries in the Kyrgyz city of Cholpon-Ata. In implementing its currency plan, the Turkish leader holds great hopes for China, Russia, Ukraine and Iran, with whom they have already agreed on a gradual transition to trade in national currencies. The Turkish economy is one of the most dollarized in the world, but the diversification of trade will allow, if not to get rid of American dependence, but at least to minimize it. Erdogan's son-in-law Berat Albayrak, appointed by the Turkish Minister of Finance, stands behind the project to undermine the dollar. Even if he is perceived in the media only as a son-in-law (Erdogan), it is he who is the main fighter for giving up the dollar. While still a Minister of Energy, he worked on new contracts to bypass the dollar and presented them as innovative developments. 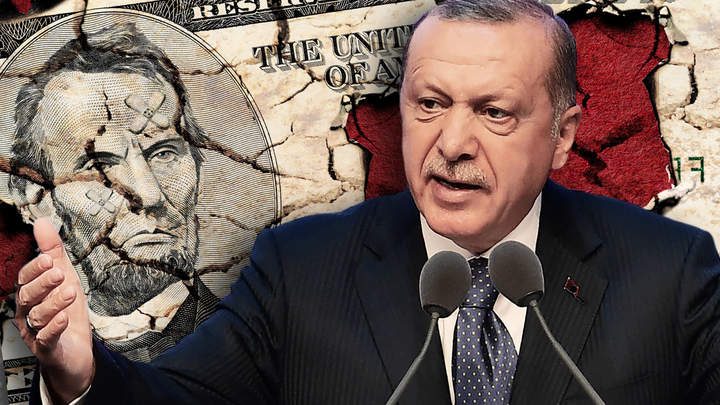 In the light of Trump's policy and the use of the dollar as an economic weapon, Turkey, by its initiative, certainly was struck by the nervous end of the dollar. The economic war against China, the US withdrawal from the Iranian deal and sanctions against Russia create an atmosphere in which the global American role is increasingly being questioned.